Each year the Observatories organizes a series of free public lectures on current astronomical topics. These lectures are given by astronomers from the Carnegie Observatories as well as other research institutions. The lectures are geared to the general public and are free. For more information, including lecture topics, please visit the Carnegie Lecture Series page. The Observatories of the Carnegie Institution for Science is proud to present Everyday Cosmology, a website devoted to the history of cosmology from the time of Galileo to the present day. Learn about the most important discoveries in Astronomy that have shaped our view of the Universe. Includes an historical time-line and learning activities. 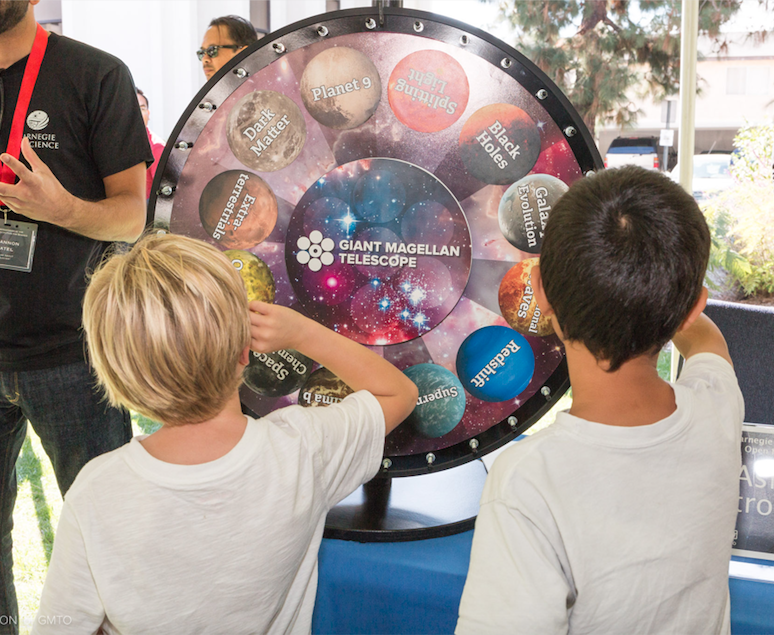 The Observatories of the Carnegie Institution for Science maintains an active public outreach program aiming to interest the general public in astronomy, provide science education activities and resources for students, and to connect our scientists with the community in Pasadena, Los Angeles, and beyond. Carnegie astronomers connect with the public in a number of ways including classroom visits, community lectures, school science nights, science festivals, visits to community groups, and more. Our scientists have a number of outreach resources, including a portable inflatable planetarium that we can bring to schools, libraries, and community events. If you are an educator in the Los Angeles area looking for an astronomer from Carnegie Observatories to visit your classroom or event, please contact outreach coordinator Jeff Rich. We have recently partnered with the Mt. Wilson Institute on STEM Educational field trips to our historic Mt. Wilson Observatory. Astronomers from Carnegie provide scientific lessons at the telescopes and connect our modern research with the fundamental discoveries made at Mt. Wilson. To find out more, visit the Mt. Wilson Institute’s STEM page. Each year we also hold an annual Open House at our Santa Barbara Street campus. This event is usually the second Sunday in October, and features several family-friendly activities, displays, and talks. Finally, we are part of City of Astronomy, a network of 11 institutions in the Pasadena area that work together on Astronomy outreach activities big and small. Several partners have regularly scheduled public events, including monthly public astronomy lectures at Caltech Astronomy.